Is it just me, or does it seem like the promise of new technologies is finally starting to pay off? When I was in junior high I got my first film camera, a Bell & Howell that took 110 film. It was so awesome (to me at least) I kept it in its protective plastic case (which was about three times bigger than the camera itself) whenever I wasn't using it. The idea of being able to have my own movie camera was so impossible I would have never even thought of it. But that's not the world my daughter is growing up in. 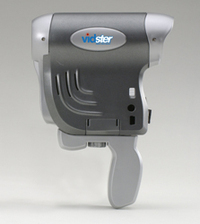 Mattel has recently announced the Vidster (pictured), and from what I've read it seems like they've got it right. For $80 you get a fully functioning, durable video camera (no LCD viewer though), that stores video to an SD Memory card (it comes with a 32 MB card, but you could upgrade it of course). It also runs on 4 AA batteries and ships with video editing software for kids. In my mind this is exactly right. The memory card means no tapes or fine mechanical moving parts for a child to break, and the fact that it runs on AA batteries means no freak-outs from your kid when the camera isn't charged up when he or she wants it. Plus, spending time with your young Fellini editing a movie that they shot is the kind of dad/kid activity that I'm all about. I'm guessing this is going to be a popular Christmas gift this year. Also on MDD - First digital camera.